2013 GNYC Pinewood Derby details announced! We’re pleased to announce the final details and opening of pre-registration for the 2013 GNYC Pinewood Derby! This year’s Derby is open to all District First, Second, and Third place winners, and will take place at Yankee Stadium on Saturday, June 1st! After an extensive discussion within the organization, the Boy Scouts of America’s approximately 1,400 volunteer voting members chose to adopt the membership policy resolution and remove the restriction denying membership to youth on the basis of sexual orientation alone. The final vote breakdown was 61.44 percent for the proposal, and 38.56 percent against. The change takes effect Jan. 1, 2014. Tonight, the National voting members of the Boy Scouts of America passed the resolution that eliminates membership standards for youth members. The Boy Scouts of America is a youth-centered organization and the Greater New York Councils is pleased that openly gay youth can participate in Scouting’s meaningful leadership development programs across the country. This is positive step in the right direction. However, we remain extremely disappointed that the resolution did not include gay adult volunteers and we will continue to work towards a fully inclusive national policy aligned with our own. We strongly believe that both gay adults and youth must be welcomed in Scouting. Below are the 18-Month Calendar brochures for Activities, Camping, and Training. Thanks to each of you for your part not only in putting the information together, but fulfilling the mission behind the Scouting Program! Hope you’re all doing well! I’d like to share with you the GNYC 18-Month Activities, Camping, and Training Calendar brochures! These living documents will help as you and your Unit plan out your Scouting calendar for the next year. Gathering at Bocelli’s Restaurant in Grasmere, the Staten Island Council of the Boy Scouts of America held its quarterly meeting. Council President John Caltabiano opened the meeting. Council President Caltabiano noted that the Phase II of the preservation of Pouch Camp as part of the Greenbelt is underway, and should be finished before winter. This will substantially preserve the current nature of the Pouch Camp tract. A third phase will complete the effort. At the assembly / muster area there will be Parade Marshals who you will be able to go up to and ask where your group will be assemblying. You will be able to tell who the Parade Marshals are as they will have a baseball cap on that says “MARSHAL”. Tell the Marshal what group you are with and they will tell you what Division Number to report to. The Parade Marshal will then direct you to a DIVISION, either Division 1, Division 2, Division 3, Division 4 or Division 5. Want to take your Troop’s program to the next level? Gear up for a weekend of adventure, including the one-and-only “Tough Scout Obstacle Course”, an off-road biking course, canoe tug-of-war, and tons of other activities, capped off with a HUGE Scout Show featuring live entertainment and a laser-light display! 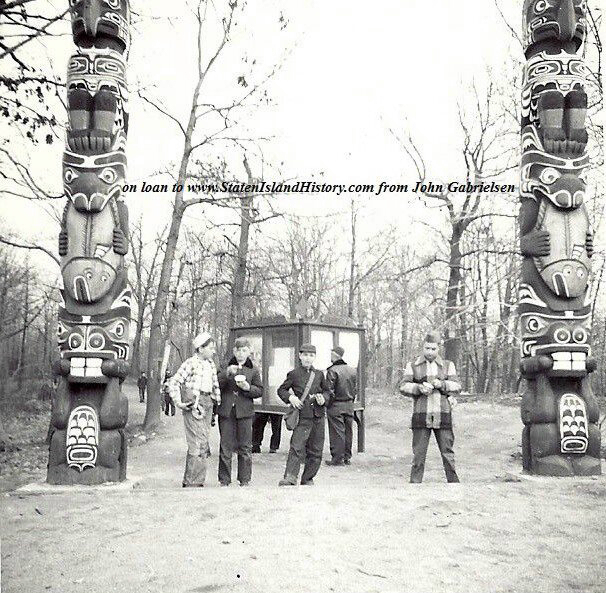 All this and more is happening Columbus Day Weekend, October 11-14, at the Big Apple Jambo at Camp Pouch! 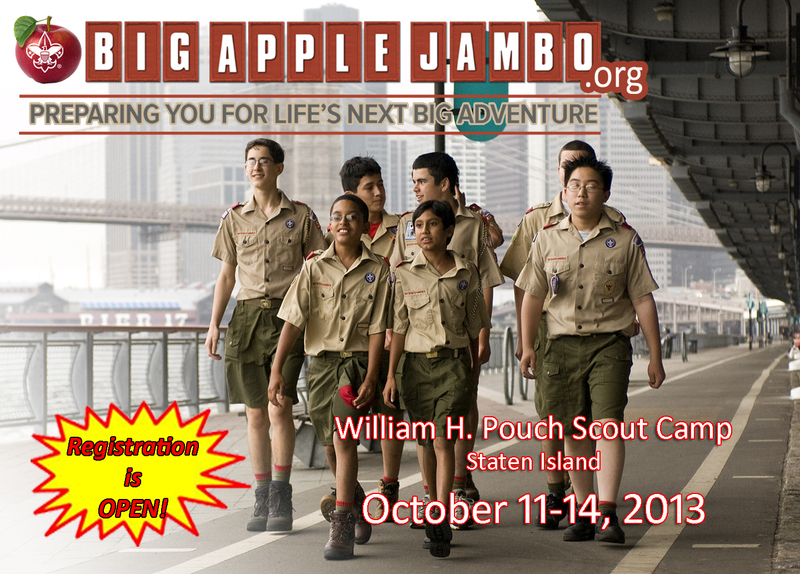 The price tag for the weekend includes all activities, your camp site, all meals, and the Big Apple Jambo patch! For the full scoop, schedule of events, promotional materials, and to sign up, CLICK HERE! As you may know, on May 23, 2013, the voting members of the national organization of the Boy Scouts of America will vote on a resolution that ends discrimination against gay youth. The Greater New York Councils views this resolution as a positive step forward that is consistent with our long-standing policy and beliefs. At the heart of our mission is the well-being and positive development of the young people of New York City.